In mid-November, before Beirut even had time to recover from Lebanon’s presidential election a month before, the city was again awash with banners and slogans, this time for the 14th annual Beirut Marathon. Alongside leftover campaign ads featuring the country’s new president, Michel Aoun, and Prime Minister Saad Hariri were little running figurines overlaid with the blue logo of the Lebanese Blom Bank, the run’s sponsor. May el-Khalil, the charismatic founder of the Beirut Marathon Association, introduced long-distance running to the city in 2003. She had just recovered from a near fatal accident, having been hit by a bus while training for a marathon in 2000 and told by her doctors that she would never run again. “As soon as I came out of my coma I realized I was no longer the same runner I used to be,” she said at a TED conference in 2013. “So I decided if I couldn’t run myself, I wanted to make sure that others could. Out of my hospital bed, I asked my husband to start taking notes, and a few months later the marathon was born.” Her husband, Faysal el-Khalil, is a soft-drink executive with businesses across Africa. “May is a force,” Chirine Njeim, a former Olympic skier turned runner who represented Lebanon in the 2016 Olympic marathon, told me at the ballroom of Beirut’s exclusive Lancaster Hotel before a press conference the day before the 2016 race. “She is the key to all of this. You have to have a great leader in order to put a great race together.” It was easy to spot Khalil amid the swarm of journalists, athletes, and event organizers: poised, calm, impeccably made-up, and dressed in a fitted but modest black suit and four-inch heels. REUTERS, May el-Khalil, the founder of the Beirut Marathon Association. On race day, I woke up at six o’clock and set out from my hotel for the starting line. The crowd’s liveliness—runners everywhere stretching or warming up to loud Lebanese techno beats, waiting for the emcee’s countdown—far surpassed that of any other marathon or half marathon I had run during my yearlong tour participating in races across the Middle East. I jogged past Coe, Khalil, and several other dignitaries, waving to the marathoners from an overlook, and began my four-hour journey. The course began near the Beirut Souks, a high-end commercial district built by Solidere, a company that Hariri’s father, Rafiq Hariri, charged with revitalizing the city center in the 1990s after 15 years of civil war. It then wound toward the Mediterranean along the Avenue de Paris, part of the corniche that juts out into the bay. Nine kilometers in, I reached the Hamra district, the cultural heart of the city and known for its diversity. We circled around it before heading south down the palm tree–lined Avenue Général de Gaulle. Nearly midway, the runners reached Horsh Beirut, an urban park that had once been razed by Israeli jet fighters during the 1982 Israeli invasion of Lebanon but was now fully restored with playing fields, wooded areas, and gardens. The last stretch of the run took us through the fashionable neighborhood of Mar Mikhael, before crossing the finish line in Martyrs Square, to honor the deaths of Lebanese nationalists executed there during Ottoman rule. As I made my way through the crowds into the tents where they were serving piles of shrimp, fruit drinks, Baalbek, fatayer, and kunafi, I passed by Coe and his wife and other dignitaries, who were snacking in their running shorts. It was a bittersweet moment. It marked the end of my yearlong tour running marathons throughout the Middle East. "SOME THROW ROCKS. SOME PROTEST. WE RUN." From November 2015 to November 2016, I traveled all over the Middle East trying to answer a question: Who would put on these races in places roiled by constant discord and despair? Moreover, who would run them? I started my tour in Erbil, Iraq, and from there went to Israel, Palestine, Jordan, and Lebanon. Unlike in New York or Boston, where you might run for a variety of charities, in the Middle East it was for a political cause. In Palestine, I ran for the right to movement and women’s liberation. In Amman, it was for peace and refugee rights. And in Beirut, it was for the rebuilding of a country. In Erbil, it was all of the above. It seemed that after September 11 and the subsequent invasion of Iraq and the fallout from the Arab Spring, community leaders, NGOs, municipal organizations, and even tourism operators started looking for ways to prove the Middle East’s normalcy to the rest of the world. Marathons were one of those ways. And they now fall into two categories: cause marathons (usually for peace or rebuilding) run by nonprofits; and tourism marathons. The marathons started by tourism operators to drum up business are generally small, loosely arranged, and designed for amateurs. The cause marathons draw the largest numbers, are the best organized, and gain both domestic and international recognition. Often, marathons do substantially advance the very causes they aim to spotlight. “There is perhaps no better way of investing in infrastructure than a marathon,” said Jason Pearlman, a spokesperson for the Jerusalem Development Authority, which has put on the Jerusalem Winner Marathon since 2009. The 26.2-mile race demands a paved road and safe conditions, which can help spur the rebuilding or fixing of roads and pathways or the economic revitalization of neighborhoods through which the course passes. Although it’s difficult to know how much was spent on each of the marathons I ran, an elite event costs nearly $1 million in road closures, policing, and repairs. Boston shelled out $858,000 for road maintenance in 2013, and that was before the bombing. Now there are increased security costs on top of it all. The marathon could also mend the economy after conflict. In Israel, the second intifada, between 2000 and 2005, had taken its toll on the tourism industry, with visitors barely reaching two million per year between 2001 and 2007. But in March 2016, more than 30,000 people, including 2,600 runners from 65 countries, ran the full marathon, climbing the ancient hills of the city and darting through the gates and alleyways of the Old City. Pearlman also noted that the 2016 marathon saw an extra 10,000 hotel bookings. Prime Minister Saad Hariri and Lord Sebastian Coe running the 10K, Beirut, Lebanon. As in Israel, in Palestine politics finds a way to meddle in this seemingly innocuous sport. In April, I traveled to Palestine to take part in the fourth Right to Movement Palestine Marathon. It was a widely celebrated event. Shopkeepers stayed open late to accommodate the tourists streaming in and out of the Bethlehem Square Peace Center carrying canvas marathon tote bags, which held a one-size-fits-all T-shirt, a race bib, and a packet of dates—“locally produced and the best fuel for running,” George Zeidan, a tall, resolute 27-year-old marathon organizer, told me. The Right to Movement was the brainchild of two Danish entrepreneurs, Laerke Hein and Signe Fischer Smidt, who—inspired by the UN’s Universal Declaration of Human Rights, which decreed that all people have the “right to movement”—decided to organize a marathon to highlight the effects of the Israeli occupation. But after the Danes returned home, the logistics of the run fell to Zeidan and Isid. Initially, running, as a sport, was completely foreign to Zeidan, a Palestinian basketball player, and Isid, as was the concept of holding an international marathon in Palestine—a place where no city road stretches beyond 20 kilometers before it hits the 25-foot-high separation wall, or jidar al-fasl al-unsuri (“wall of apartheid” in Arabic). The author running in the Beirut Marathon. The first thing marathon runners encounter in the Palestine run—after passing a “Star and Bucks” café and a few shops selling multicolored keffiyeh—is the separation wall. Covered in graffiti and attended 24/7 by Israeli soldiers, it surrounds Bethlehem. Thanks to the infamous street artist Banksy, who covered the wall in his signature stencils and trompe l’oeils, the wall has also become a tourist attraction. We started in Manger Square, so called because it is where Jesus is believed to have been born. We then turned left beyond the gate of the Aida refugee camp, where the apartment buildings and houses were swiftly deteriorating. Runners dodged a sheepherder and his flock, then started snaking up 1,800 feet toward Hebron. At that point, seven miles in, people started dropping out, whipped by the steep incline. It’s a common problem, said UN human rights lawyer and ultramarathoner Stephanie Case, who took it easy, weaving among the runners and high-fiving little kids yelling, “Ahlan wa sahlan!”—Welcome!—as they passed. The run ended, to everyone’s displeasure, with yet another steep uphill push back to Manger Square, which boomed with a mix of Western and Lebanese dance music. At the finish line, Zeidan and Isid were busy responding to international reporters and deflected questions about Masri and the other Gaza runners. It wasn’t the first time the Right to Movement runners were overshadowed, and it wouldn’t be the last. 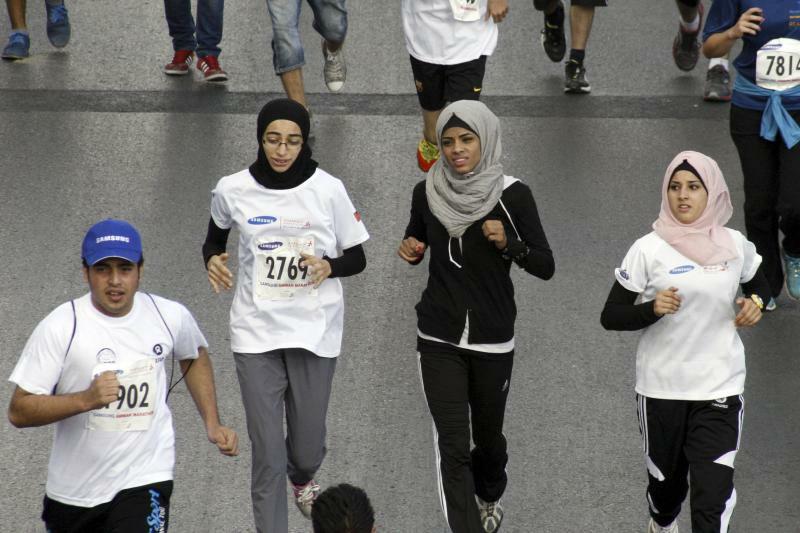 Runners take part in the fifth Amman International Marathon in Amman, Jordan, October 4, 2013. In Jordan, the royal family is involved in nearly every corner of the country’s cultural and political life, including Run Jordan, which is overseen by His Royal Highness Prince Firas bin Raad. The Amman Marathon, which was founded in 2009 with the help of the Beirut Marathon Association and the Jordan Olympic Committee—also overseen by the royal family—has always had as its primary mission strengthening Jordan’s desirability as a destination for international sports. But Run Jordan, the nonprofit that oversees road racing in the Hashemite Kingdom, has, from nearly the beginning, been operated day-to-day by Lina el-Kurd, a former marketing and public relations manager. She had landed Samsung Electronics Levant as the marathon’s main sponsor for the 2011 run and had been hoping to bump up the marathon’s IAAF ranking from bronze to silver, which allows it to bring in more elite runners and spectators. “Amman used to have just hundreds of runners,” Kurd told me in late October after I had arrived to run the race. Well-coiffed and subtly made up, she was wearing a Run Jordan polo, black pants, and Asics sneakers. “But now we have around 15,000 participants in all races, and 500 people for the full marathon, compared to only ten in 2008. I can see that running is picking up around the region, especially among the [running] clubs we started in Amman and Aqaba.” Kurd added that Run Jordan aimed to have thousands running the full 26.2 miles in the near future. The day before the marathon, I had arranged to meet Moath al-Khawaldeh, a Jordanian and Olympic marathon hopeful, at the exposition building in King Hussein Park, where I picked up my racing bib. A former cigarette-smoking underachiever, Khawaldeh came to the sport later in life. At the age of 14, he entered a local race on a dare and placed fifth out of 300 runners without any training. Four years later, he landed a sports scholarship to study at the New York Institute of Technology and to run for the prestigious New York Athletic Club, a training ground for future Olympians. When he returned to Amman, however, he faced a choice: either join the military to continue his training or self-coach while working full-time. Since he had developed a taste in international peace building while interning at the UN, Khawaldeh chose the latter, finding work with a Jordanian-based NGO, Generations for Peace, which operates programs across the Middle East and North Africa to counter violent extremism. He now feels pulled between his work and his dream of becoming a professional runner, which requires convincing an organization such as the New York Athletic Club or another sports foundation to support him while he trains. Either that or migrate to a country, such as the United Kingdom or the United States, where the corporate sponsorship money to train prospective Olympians floats a bit more freely. Before dropping me off, Khawaldeh offered some advice: “Don’t worry too much about the hills. The course is fairly flat. You might even win your age group or place overall.” Unlike the other running events, the one in Jordan was still relatively unknown internationally, and this year there were only 10,000 runners across all the races. With the hope of carrying home a trophy, I woke at dawn and sprinted to the marathon buses in Sport City, which carried all of us to the Roman Amphitheater, the beginning and finishing point of the marathon, the half, and the 10K. The course would take us along one large loop of the downtown market, skirting the edges of the hills, and it would be run two or four times depending on whether it was the half or the full marathon. We started without fanfare down Hashemi Street past the hardware and vegetable souks, the Museum of Popular Traditions, Hashemite Square, and Amman municipal buildings. For the first hour, at least, our only fans were the hundreds of gendarmerie lining the route and groups of local teenagers handing out full bottles of Aquafina and cups of iPro Sport, Jordan’s version of Gatorade. The race, from my vantage point, looked to be made up almost entirely of men, with a sprinkling of women in nylon pants, long-sleeved shirts, and hijabs. Khawaldeh’s encouragement rattled in my head. But I was soon looped by the Kenyans and several newly minted NGO workers. After I downed my fifth full bottle of water, I crossed the finish line, welcoming the reprieve from the sun, the slick of car oil on the streets, and the annoyed merchants walking across the course. A kid hung a Samsung medal around my neck and announced me a finisher in both Arabic and English. Participants rest at the Roman Ampitheatre after taking part in the third Amman International Marathon in Jordan, October 28, 2011. In late October 2015 in northern Iraq, as fighters from the Islamic State (also known as ISIS) held their positions in a peshmerga-backed perimeter outside of the city, men wearing everything from soccer cleats to Chuck Taylor All Stars—along with a small handful of women in matching hijabs and Adidas pants—took their positions in front of the starting line of the Erbil Dream Marathon. They mulled around under a larger START sign notated in both English and Kurdish in bright yellow block letters as they waited for the all-familiar crack of a gun. Thirty minutes went by when, without warning or fanfare, the pistol went off and the racers sprang forward. The more seasoned runners paced themselves. Those less so sprinted in short bursts whenever the adrenaline kicked in, then walked as their legs grew tired. Everyone passed a few cheering bystanders, but Erbil didn’t draw crowds as in Beirut. Mostly, runners were greeted by bemused soldiers protecting the government outposts along the two circles of the normally heavily traffickedroad, which is home to an array of hotels, furniture stores, and numerous billboards announcing housing developments such as Florida City, Erbil Dream City, and Skyscraper City. Erbil, like so many other cities in the Middle East, once experienced the same phenomenal growth as its Gulf brethren owing to its equally vast expanse of oil and gas, and dreamers and developers swooped in to build luxury hotels and world-class malls, while urban planners and engineers plotted to revive its centerpiece: the 7,000-year-old Citadel. But nearly everything was stalled or terminated in 2014 when ISIS invaded the region. After 13 miles—the full marathon was canceled because of ISIS-related concerns and the inability to block off a longer length of road—runners raced or limped the final quarter mile into Sami Abdulrahman Park, the Central Park of Erbil and once the location of one of Saddam Hussein’s detention centers, to receive their Erbil Citadel–themed finisher medals. Kurdish dancers performed the dilan halperke, in which men and women link hands and dance in a semicircle while waving colorful desroke, flags that symbolize the continuity of Kurdish unity throughout history. The trophies went out to Mohammed Lacey from Diyarbakir, Turkey, and Bushra Rauf Saleh, a 17-year-old girl from Erbil’s Peshmerga Sulaymaniyah Running Club. “We aim through this marathon sprint to send a message of peace from Erbil to the entire world,” said Abdulsattar Younus, an official from the Kurdish regional government overseeing the race. “According to our views and our attitudes, we in the sport are brothers in humanity.” It is a noble message, but it also seemed naively hopeful. As the news would later reveal, at the very moment the race ended, ISIS had released footage of three peshmerga soldiers beheaded in nearby Hawija. But a year later, with Mosul under siege 50 miles away by both the Iraqi army and the U.S.-backed peshmerga, the organizers of the Erbil Marathon still held the race. On October 28, under the slogan “Peace for all . . . toward national reconciliation,” more than 4,000 people, including 400 expatriates, participated, down from 7,000 the year before. Finishers and winners held up “Thanks, Peshmarga [sic]” signs for the cameras and put on smiles. Back in Jordan, Khawaldeh is still dreaming of becoming an Olympic runner. He has yet to cross the Amman Marathon off his list, but running marathons across the Middle East and around the world has brought him some unexpected friendships. He met Georgie Cottle, the Edinburgh University student who finished first in the Amman half marathon, through Amman Road Runners, and they have since trained together. “It has been a real adventure running with Mo,” said Cottle, who regularly does long runs inside and outside of Amman with Khawaldeh. “As much as I hate to admit it, by myself, the most training I could probably manage would be neighborhood runs very early in the morning or perhaps just the treadmill,” Cottle explained, adding that she now understood the reasons female participation in running, especially at a professional level, remained low in the Middle East. “It’s not easy unless there happens to be someone else wanting to run with you, at the same pace and at the same time—a needle in a haystack for sure.” Not many women in the region run, as it’s still seen as an unusual pastime. Mo’ath al-Khawaldeh, Jordanian Olympic marathon hopeful.